What have we learned from the Lake Suigetsu varves? 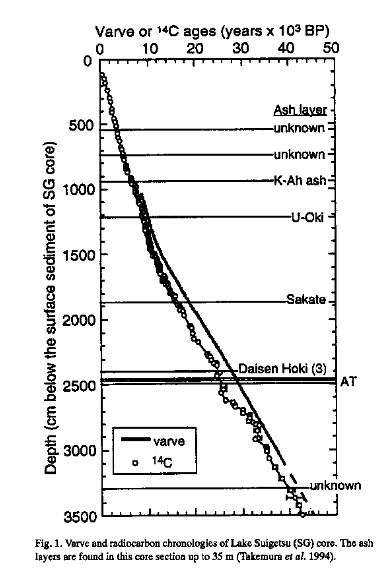 The graph above is a summary of comparison of carbon-14 activity with tree rings and with lake varves from Lake Steel in Minnesota and Lake Suigetsu in Japan. It was prepared by geologists Davidson and Wolgemuth. Notice that as one moves deeper into the sediments of a lake (varve data) that the total amount of C14 gradually declines. There is no abrupt break in C14 concentrations suggestive of large changes in radioactive decay rates in the past as predicted by some young-earth creationists. This is an updated and expanded version of a previous article posted in November of 2011. « A Creation Museum Speaker Asks: Do Animals Evolve? Wonder how long it will be until Young-earthers give up on using to geneologies to date the earth, and just stick to “6 calendar days” and “no death before the fall” to justify their model. If they could get about 50,000 years that would give them a lot more wiggle room. If they throw out biblical inerrancy — the sole epistemology for young-earth creationists — they won’t be able to agree on anything any longer. Do they accept 10,000 years, 50,000 years, 500,000 years? How many ice ages? Which dating methods? There’s no rational way to reach consensus if they abandon both biblicism and the scientific method. Gaps in geneologies make sense in cultural context and do not require a rejection of inerrancy. I never got far when arguing with a creationist that Scripture should be looked at through an historical and cultural context, which can be different from a literal reading a modern Western person might default to. The response I have gotten is, “So, you believe the ancient people reading it were stupid!” It is odd but telling, such a response. In a way, people who follow YEC are trapped in a modern way of thinking although they would be the first to condemn “modernists.” I mean that they are trapped in a modern, reductionist type of thinking so that even ancient cosmology has to be made “modern” and fit into modern pseudo-science. Young-earth creationism is incredibly young theology. As I’ve said numerous times, Martin Luther was the sole mainstream Christian proponent of theologically-necessary six-day creationism prior to the late 20th century. Yes, YEC as it exists as a system is recent and is largely (especially concerning the Flood) the work of Seventh Day Adventists who wanted to prove the earth is young because that is what their prophet, Ellen White, believed. So now this has become a major doctrine in many Evangelical and most conservative Baptist and conservative Lutheran churches. Speculation that the earth is young based on genealogies in the Bible and counting the years is much older, but I don’t think that was often made into a major doctrine until YEC. Luther believed the earth was created around 4,000 B.C. but I don’t think he made a major doctrine out of it. I was raised Lutheran and there is quite a dividing line between those who believe in YEC and those who don’t. Here we are taught about the beginning of man, that the first man did not come into existence by a process of generation as reason had deceived Aristotle and the philosophers into imagining. When Moses writes that God created heaven and earth and whatever is in them in six days, then let this period continue to have been six days, and do not venture to devise any comment according to which six days were one day. But, if you cannot understand how this could have been done in six days, then grant the Holy Spirit the honor of being more learned than you are. Clearly seemed to make it an issue of “biblical authority”. Of course he made all his pet worries into issues of biblical authority. Like transubstantiation and geocentrism. I was raised in a Lutheran denomination that at the time was kind of moderate and Luther’s ideas of six days of creation held as much weight as geocentrism – I just have a memory that such things were not a big issue and people could have various beliefs – but that was years ago. Transubstantiation was another matter, lol! The bit about “let this period continue to have been six days, and do not venture to devise any comment according to which six days were one day” is interesting. There were a few (I think in Luther’s time and earlier) who believed that a doctrine of six literal days of creation denied that God was all-powerful. They taught that God must have created everything in an instant because an all-powerful God would not “need” six days. That could be what Luther is addressing. Anyway, it is also true that YEC became important in the conservative Lutheran denominations and I have noticed that they have doubled-down on supporting YEC and there really isn’t room for discussion. They see it as a matter of biblical authority, like you mentioned. A few years ago I tried going to conservative Lutheran churches but one of the reasons I could not join was YEC and I eventually moved on to another denomination. Indeed, Augustine and others suggested that the six days of creation were either a single moment or a shorter period. Clearly, this deeply offended Luther. His penchant for being insistent about the necessary doctrinal importance of inconsequential things was…pervasive. You’ve said this before, but haven’t answered my objections. And so on, are you claiming that Arpachshad did not have a son named Shelah when he was 35 years old? That’s the only way to fit new people into the genealogy. Depending on how far back you want to push the flood, you might need to insert hundreds or thousands of generations between each biblical patriarch. I don’t see how you can contradict the biblical genealogy that way and claim to be an inerrantist. What makes more sense in cultural context is that the biblical genealogies were inventions, just like the genealogies of other ancient cultures and even some modern oral cultures. …that the geneologies have missing names. Otherwise some NT geneologies contradict some OT ones. The contradictions between the two NT genealogies (with each other and the OT genealogies) is not a matter of missing names. They are simply different, giving different fathers for the same individuals in some individuals and displaying no overlap where there is no common OT source. This is not compatible with literalist/inerrantist claims. Becoming the *ancestor” of Shelah need not mean Shelah is born at this time. It could be taken to mean that Arpachshad’s DIRECT descendant who would eventually give rise to Shelah was born. I realize this seems strange and contrived in our modern culture and language, but it would make since to the ancient Israelites. In other words, Arpachshad’s age was 35 years before Shelah’s birth + 403 years after Shelah’s birth. Where in that gap do you insert the “missing” generations? I realize this seems strange and contrived in our modern culture and language, but it would make since to the ancient Israelites. But that’s now how any ancient Jewish interpreter that we know of understood it. In fact, the rabbis believed that Shem was still alive in the days of Abraham because of this genealogy. The ESV more accurately reflects the hebrew “And Arpachshad lived after he fathered Shelah 403 years”, so he lived 403 years after he gave rise to the familial line that would eventually result in Shelah. Hints allows for gaps in time. Many scholars recognize gaps in the geneologies. Many ancient geneologies are like this, they cut it down to a specific number of individuals because the total number would be absurd. Furthermore, you said earlier “you might need to insert hundreds or thousands of generations between each biblical patriarch”, This is actually absurd. Just one hundred between each patriarch would mean you get a date of 400,000 years for the flood. A thousand would mean 4,000,000. Why on earth would you want to push it back that far? I estimate a date for the flood at around 70,000 – 55,000 years ago (Manot cave in Israel shows true modern humans living there by at least 52,500 years ago, so I wouldn’t go for a flood-date younger than this) . Meaning a little over 10 gaps per individual (on average). The structure of Hebrew also makes it possible that the number of years in some places could actually be counting months on a lunar calendar. Obviously this doesn’t hold clear for all instances (Enoch could hardly father Methusaleh at age 5) but it could explain the inflation in certain cases. Contemporary genealogies often attributed tens of thousands of years to the reign of each ancestral king, so scribes may have multiplied numbers by 12 for numerological purposes. Yeah, a few different ways of converting the ages to something sensible have been proposed, but there’s really no reason to think the author means anything other than years. Numerology is definitely involved. If you add up the ages of the patriarchs from Adam to Moses in the MT (note that this includes overlapping lifespans), you come up with exactly 12,600 years — a number equal to 3.5 luni-solar years of 360 days. This is not a coincidence, but a specific numerological formula we also find applied to Daniel (where 3.5 is also a significant number). Obviously, real history does not work out this way; the ages of the patriarchs are inventions meant to tell a theological truth. Proving a narrative teaches a theological or moral truth does not invalidate the narrative as historical. Jesus life and death tells many theological truths, but Jesus is clearly a historical figure. There is no reason to think that Adam, Noah, etc. are not real people who existed in real history. There is no reason to think it is impossible that ancient people could have actually lived that long. There is no reason to think it is impossible that ancient people could have actually lived that long. Of course there is: the principle of analogy. We know ancients made up stories about long-lived kings and patriarchs all the time. We do not have any evidence that people can really live that long. We “know” nothing of the sort. Their are stories of long-lived kings outside of the bible, but we don’t know they are made up. We know that different accounts bear contradictions, but that simply means that some (not necessarily all) accounts are somewhat inaccurate. It does not follow that they are entirely fabricated. If there really was a time in the ancient past (prior to the scattering of humanity around the world) when people lived an order of magnitude longer than they do today, it would stand to reason that there WOULD be many accounts of long-lived individuals from different cultures. And even if they were fabrications, we must remember that divine inspiration is not the same as “automatic writing”, the text doesn’t just drop out of heaven fully-formed. God can use many sources and many hands (including editors) to create an error-free text as the end result. So even if Genesis simply copied with modifications some other text (or texts), it does not follow that the text is a false history of the world. That statement is debatable. Certainly nobody today lives that long, but there is no evidence that rules out that people could live that long under the right conditions. Absence of evidence is not evidence of absence. That being said, many have argued that humans (among other lifeforms) are “programmed” to die. Our genes intentionally limit our lifespans. I heard of a book that argued that a few simple genetic tweaks could potentially extend human lifespans beyond 1000 years. God could have created us without these limitations, but later due to natural, random mutations we lost the ability to live that long. That statement follows from observational science. Of course, you can always say ‘it’s impossible now, but perhaps it was possible a long time ago’, but you need a bit more than that to be convincing. Yes, cells are programmed to die, but there is a lot more to ageing than just that. The Bible gives every indication that man was not created immortal (he needed the Tree of Life), so both biology and theology argue against you, in my opinion. Furthermore, even the long life spans won’t give you the sort of time frame scientist have discovered. There were humans way before 60.000 years ago, the earth is much, much older than that. This sophism is an epitome of creationist reasoning, a perfect example of the reasoning employed and VERY frequent. It allows the creationist to disregard everything – as if there is evidence contrary to point A, it implies evidence in favour of A is absent Moreover, it allows the creationist to disregard all evidence of absence. Run away screaming is anyone uses it! The numerous mechanisms proposed to explain extremely long lifespans — increased preflood oxygen levels, protection from radiation by magical floating canopy, etc. — fall spectacularly flat when you realize that we have done experiments under precisely those conditions with no significant increase in longevity. Longevity is genetic. Moreover, human lifespan is well within the range of lifespans for mammals of our size and genetic heritage; if we had started out with the capacity for 900+ years of life, it would be very unlikely that a couple of mutations would just happen to make our lifespans converge on this. Contemporary myth had kings with reigns lasting 20,000 or 50,000 years. That is…definitely made up. Now, we can argue that these individuals DID have very great ages AND that the ages were further inflated, but this seems to be a needless multiplication of entities. I’d also predict that in contemporary myth, it is the kings alone who have lifespans in the tens of millennia; commoners likely do not. This would be further evidence that the myths are using great lifespans to symbolize power/success and not in memory of actual extreme longevity. Of course Genesis is not a false history of the world, because it is not a history of the world at all. Making it out to be a history would make it a false history. Yes, the earth is older than 60,000 years. I disagree however, that humans can be said to predate this. The genus “Homo” predates this. But in my view non-homo sapiens sapiens are mere animals separately created by God. Neanderthals, Homo Erectus, etc. are simply wild animals. Big Carnivorous Primates that happen to walk on two legs like humans. Yes, SOMETIMES absence of evidence IS evidence of absence. But not in this case, among many others. The fossil record does not always leave reliable indicators of how old an individual human was at the time they died, The question is necessary “If the biblical account is true, what evidence do you expect?”. I don’t expect there to be evidence of long-life spans beyond what we have. You are citing mechanisms proposed by YEC’s in their strange model. I am refering to real biological mechanisms. Not a change in earthly conditions. I believe the conditions on earth at the time of Adam – Noah – Babel were pretty much like they were today, albeit the average temperature would be lower along with sea levels (I estimate the flood at 65,000 – 55,000 BP, within the last ice age). The mechanisms I refer to are those put forward by secular scientists, and expanded upon by OEC individuals. Reasons.org has good information on lifespans. They do not propose outlandish mechanisms such as canopies, lower radiation levels, etc. Simply that the genetics of humans allowed for longer lifespans. Although not IMMORTAL lifespans. Hints the tree of life as you suggested. No, this simply indicates that there were people who lived very long in the past, but tens of thousands of years of oral tradition distorted the accounts severely. This is not needless multiplication of entities. This is exactly what you would expect if the biblical account is true, but occurred a few tens of thousands of years ago. Their global deluge demands a young earth even if gaps in the genealogies would otherwise expand its age. Eh, giving them twice or ten or twenty times as much time would do almost nothing to help them. The sole benefit would be that they could fit Egyptian and prehistoric cultures into a timeline more easily. But the diversification of kinds into species would not have enough time, and neither would multiple ice ages. Many but not all YEC followers have an additional thing that forces them to believe the earth is very young – dispensationalism. Dispensationalists are heavy into numerlology and believe that the earth must come to an end at the 7,000 year mark and that we are on the verge of a 1,000-year earthly reign of Christ. For many fundamentalists and evangelicals, this dispensationalist system with its timelines pretty much defines Christianity – it is a central doctrine of their churches. For this reason alone many will keep to YEC. There are a few churches that support YEC that do not teach dispensationalism but any church that teaches dispensationalism will almost certainly teach YEC. I would argue that this is more than a coincidence. I don’t think the Adventists teach dispensationalism exactly like the fundamentalists understand it, but they have a system of “prophecy” that goes along with belief in a young earth. That’s a great point I didn’t think of, Jacob. I wonder if it will become less relevant the further past 2,000 we get. It will be interesting if it loses relevance. Somehow I think they will find a workaround. I studied the issue a bit as an outsider and I was shocked about how dispensationalism is a framework in which everything – past and future – is supposed to fit and it informs how every verse in the Bible is read. This is relevant because these churches have a framework of understanding history and the Bible – a worldview – that naturally accommodates YEC. Most YEC I have spoken too don’t see it this way. It’s mostly “no death before the fall” that drives their position. The idea of prophecy setting a limit on human history is an old view that was common in the early church, but not so much today. Applies to every creationist rhetorical spew ever. The first thing Reed should do, is explain why the C14 content of the layers halves at roughly every 5730 counts. In his opinion, they are not annual layers. So why the great correlation with the half-life of C14? They simply don’t get it. In their minds, they see “radiocarbon” or “dendrochonology” and immediately jump to the conclusion that the varve ages are established by radiocarbon dating. I don’t think they realize that the varve ages are INDEPENDENTLY established and are being used to VERIFY radiocarbon dating. It seems that the YEC approach to lake varves is generally the same as their approach to radiometric dating. And the YEC approach after throwing together a lot of pseudo-science to explain something is to point at legitimate scientists and say they are just guessing. 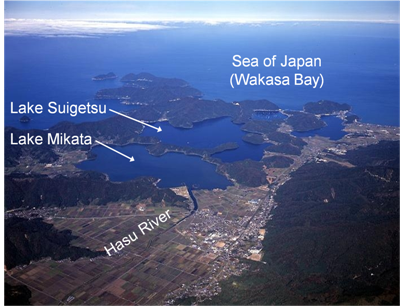 I am trying to think how the 60,000 Lake Suigetsu varves would work in the YEC scenario. I think they would have to consider the lake and its varves to be “post-flood.” Perhaps most of the varves formed in the ice age, which lasted anywhere from 250 to 700 years, depending on which YEC you ask (I give my thoughts about YEC ice ages here: https://geochristian.com/2013/04/09/the-pleistocene-is-not-in-the-bible/). I’ll give the YECs 10,000 varves in the past 4,300 years (though this ignores evidence that the varves are indeed annual). If the super-short ice age lasted 500 years, then the initial 50,000 varves would have had to have formed at a rate of 100 per year during the ice age. I suppose YECs would say that each of these represented a single storm, which hit the area every three or four days, each of which deposited a varve that just happens to look exactly like the annual varves that get deposited today. 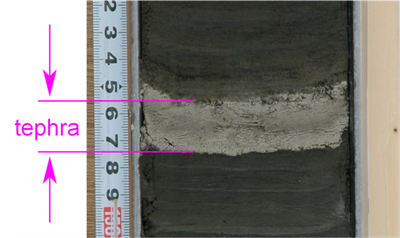 As for the tephra layers? Well, YECs will say that these are further proof of YEC flood geology, which includes many thousands of volcanic eruptions during and shortly after the flood. As for the nice correlation of radiocarbon dates to the varve years? The fact that geologists use the varves to calibrate radiocarbon dates is proof that radiocarbon dating is deeply flawed and should never be trusted. This is blatant circular reasoning, the YECs will say. And what further proof could we need of accelerated nuclear decay? And of the slowdown of Earth processes as residual post-flood catastrophism slows down. This is all easy for creation, impossible for evolution. I think I have been reading too many YEC articles. Testing in a laborotary is nothing compared to the real life conditions of the time. Plus don’t forget that cancer cells are actually immortal. immortality IS a possibility for our genetic makeup. Also the atmosphere, the purity of the earth, the potency of the – then plant foods, the stressless life of back then, the gravitic pull they had, the electromagnetic conditions, cannot be emulated now. And you think of it as a secular. For someone who believes in God’s power, we know that it is within God’s potential to “miraculously” command our lifespan to shorten or lengthen whenever He wishes. Also it makes sense that as long as humans are chronically departed from their almost perfect prototype, both genetic errors and damage accumulate. but for us christians also makes sense that distancing our selves from the initial grace, is obviously degenerating humans. We are not like other mammals, and the bible reassures we are unique as a species. And having a spiitual component in us, soul and the blow of life by the Holy Spirit, we are at the treshold between the spiritual and material realms.